The White House said US President Donald Trump is “open to visiting Moscow” as Russian President Vladimir Putin suggested on Friday and renewed the president’s proposal for Putin to come to Washington in 2019. On Wednesday, the White House announced it was postponing until next year the invitation that Trump extended last week for Putin to visit Washington this (Northern Hemisphere)?fall to continue the talks they began in Helsinki, Finland, earlier this month. That invitation stunned his closest advisers, and the delay came after Congress’ Republican leaders expressed concerns that it would generate controversy ahead of the November midterm elections. “President Trump looks forward to having President Putin to Washington after the first of the year, and he is open to visiting Moscow upon receiving a formal invitation,” White House press secretary Sarah Huckabee Sanders said in a statement. The White House was responding to reports of Putin’s comments on Friday that he’s ready to invite Trump to Moscow and ready to visit Washington if conditions are right. Speaking to reporters during a visit to South Africa, Putin said he shares Trump’s desire for more face-to-face meetings. “I am ready for that. 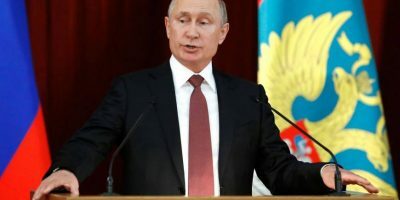 We need for the appropriate conditions to exist, to be created, including in our countries,” Putin said at a news conference. Since returning from Helsinki 11 days ago, Trump has sought to quiet the political uproar sparked by his post-summit news conference, at which he accepted Putin’s denial of 2016 election interference over US intelligence officials who say Russia did interfere in the election on Trump’s behalf. Putin, standing beside the president, acknowledged that he wanted Trump to beat Hillary Clinton. But even as the president walked back his remarks in the face of intense political pressure – and a dip in his poll numbers – he has repeatedly contradicted his expressions of support for the US?intelligence findings by condemning the Russia probe as a witch hunt and the allegations of interference as a hoax. At the same time, he has made clear his desire for future talks with Putin and an improved relationship between the US and Russia. Because Trump and Putin met for more than two hours in Helsinki without any aides and only translators in the room, the details of their conversation have remained opaque and Moscow has provided more information, some of which the administration has disputed. The White House did not say on Friday whether Putin invited Trump to Moscow during their meeting, as the Russian president seemed to suggest.